Today in the Morning circle we reviewed Halloween flashcards and they have a really good grasp of Halloween vocabulary now. 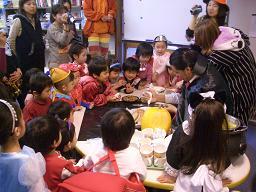 The kids also enjoyed the story “Ten Trick or Treaters”. In craft time the children made a ghost and liked to pretend it was real! We have started playing a new game called “Musical Bones”. The children have to walk around the table to music and then when the music stops grab a “Bone” off the table as fast as they can or else they are out as the teacher removes one bone at a time. S.K. won this game and said in English “I am the Champion!”. In the afternoon the kids made goodbye cards for N.K. who was having her last day at the school. At 1.55pm the children sang the “Goodbye” song to N.K. Today we sung the Good Morning/ Afternoon/ Evening song using the different suns, rising and setting. We played guess the card with our Halloween flash cards. We finished with the Halloween story "10 Trick or Treaters", counting along as we read. We sang "Fly little bats", "One, two buckle my shoe" and "I love you". Rompers reviewed their O and P vocabulary flash cards. We completed an O worksheet with a find the oranges section. To finish the lesson we used the flash cards to see who could guess the name of the O object the fastest. After Language Arts we had P.E. We had an autumn leaf race in pairs. The students had to race each other to the felt board to put up five leaves, one at a time. The fastest was the winner. We then did the same thing but with balls and baskets. This time there were fifteen balls and the students could take as many as they could carry each time they ran to the basket. Before lunch we did a puppet show of "The Big Pumpkin". 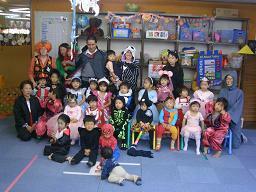 The Halloween version with the Witch, Mummy, Ghost, Monster and Bat. After Lunch we made bones from newspaper for a Halloween game we will play on Wednesday. Saying good-bye we read "a porcupine named fluffy". 最後は全員で "Happy Halloween to you～!!" と大合唱!! Today in the morning routine we studied Feelings, Halloween flashcards and animals and then after this we had a story called “Say Boo!”. In Toddler time we studied ｓhapes and numbers and had a story called “Bear in a square”. Further on into the morning we had Craft time which was to make a Trick or Treat Bag and they decorated their bags with Halloween icons like a Witch, Bat and a Jacko-o-Lantern ..etc. After Lunch the kids made a Birthday card for A.S.
And then they practiced an important motor skill, throwing. They had to throw a pumpkin (made from paper) through a large Jack-o-Lantern. We began the morning as normal with everyone singing the Hello Song. Next we sung the days of the week and months song. The children practiced saying "Today is Monday October 22nd". This week is "P" week so we looked at some new P vocabulary. We finished morning circle with colors and the rainbow song. For songs today we did Hot Potato and Peter Hammers. We also sung the Halloween song fly little bats. Today Rompers studied their P vocabulary and practiced written work with a P worksheet. They then had Math. Rompers 1 and 2 both did worksheets that required them to cut and paste the specified number of hot dogs or hamburgers in the box. This was challenging and they really had to concentrate. Before lunch we played some passing games for hand-eye coordination. We finished the day by drawing some Halloween pictures. Today in the morning circle we continued with the theme of Halloween. Firstly we studied the Halloween flashcards and then we had a story called “Spots Halloween”. In Toddler time after singing songs the kids listened to a new Halloween story called “Say Boo!” which the children really enjoyed. Later on in Craft time all the kids pieced together an Owl to continue with the Halloween theme. Then after lunch the Kinders and Rompers did some basic counting and addition activities which is part of the Math’s curriculum. Before home-time we enjoyed another Halloween story called “Where’s the Halloween treat?”.